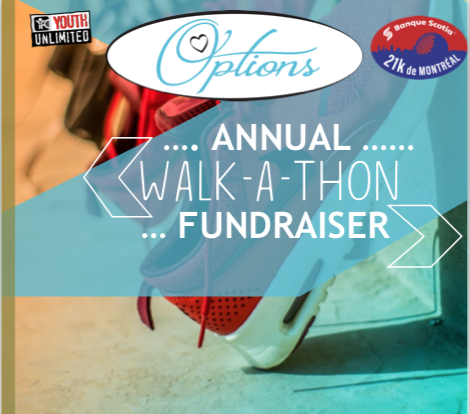 Walk or Fundraise for Options! Options Pregnancy Centre has created a team for the 2019 Scotiabank Charity Challenge at the Banque Scotia 21k de Montréal - will you join us? Options brings hope and clarity to young women, men and families affected by unexpected pregnancy. We specifically serve young women teen through 25. Our goal is to raise $5000 so Options services can remain available to young people who need help and hope. It takes a village! Thanks so much for partnering with us and we look forward to walking with you! Can’t join us at our WALK-A-THON? Show your support by supporting this fundraiser anyway! *Donations made through the Scotia Bank Challenge will receive a tax receipt from The Scotia Bank Foundation, as opposed to Youth Unlimited (Options), though all funds donated procede Options. BE A PART OF OUR WALK-A-THON TEAM! Join us in support of the work being done at in our community through Options! We will rally together for a wonderful time together, while raising funds for all Options operations: from individualized care, mental health support, pregnancy testing, medical services, workships, Mom & Tot groups and so much more. It takes a village, and we are stronger with your support! *Donations made through Montreal Youth Unlimited will receive a tax receipt. All funds donated procede Options programming and operations.